Katherine Gili, Alexandra Harley, Peter Hide, Phillip King, Tim Scott, Anthony Smart. Poussin Gallery features the work of six artists who all studied at St. Martin's School of Art at various times between the 1950's and the 1980's, beginning with two of the 'New Generation', Phillip King and Tim Scott. Peter Hide was a student in the mid-1960's, and Katherine Gili and Anthony Smart studied in the early 1970's. Our group is completed by Alexandra Harley, who was a student of the 1980's. 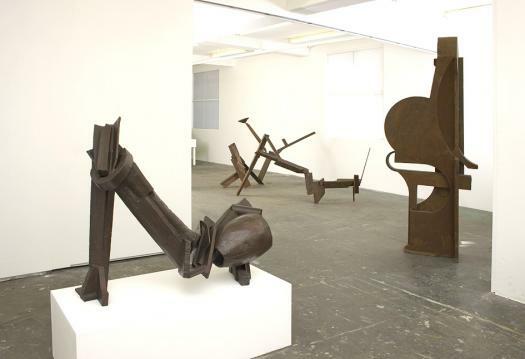 Anthony Caro was amongst the first group of artists invited to teach in the new sculpture department of St. Martin's School of Art set up by Frank Martin in the mid-Fifties. Caro soon began to exert a forceful influence, particularly upon those students who attended his informal evening classes. These were set up to attempt more fully to embrace the changes that had taken place in sculpture in the late Nineteenth and Twentieth centuries in Europe. Caro's first students included Tim Scott, who enrolled in 1956, Phillip King and Isaac Witkin in 1957, and David Annesley and Michael Bolus in 1958. By 1959, Bill Tucker had arrived, and Phillip King had already returned to teach, and by the mid-1960's all of this group had done likewise. In that ten year period, from the mid-50's to the mid-60's, the whole landscape of visual culture in Britain changed dramatically, and Caro and his St. Martin’s students were a part of that vanguard of change. On the agenda for both students and staff alike was an involvement with the 'modern' issues of expressive figuration, abstraction, surrealism and the 'organic', and the influences of Picasso, Gonzales, Duchamp, Matisse, Henry Moore and, later, after Caro's visit to America in 1959, David Smith. Added to the mix was the modernist aesthetics of the new architecture of post-war rebuilding in Europe and the general surge of invention across the creative arts. New thinking in design, fashion and music all reinforced the idea of exciting changes taking place. In the early 1960's Caro pioneered his own very original abstract steel sculptures, which were to become synonymous in the minds of many with St. Martin's, and which posed serious questions about the boundaries of sculpture, engaging as they did with the literal space of the viewer. Both before and during this revolution in his own work he was forcefully urging his new students to be innovative, to discover for themselves what could comprise a new 'reality' for sculpture. In the fifty years since then, St. Martin's sculptors have argued and wrestled with many issues, but none more so than this, the issue of three-dimensionality and what distinguishes sculpture from the literal world we live in. It is an issue that ran through much of the practical and intellectual activity that took place at St. Martin's, from Clement Greenberg's early visit in 1963 at Caro's behest, through to the notorious destruction through mastication of his “Art & Culture” essays in an event staged by John Latham in 1966; and from Bill Tucker's book “Language of Sculpture” of 1974 through to Alan Gouk's 1980 lecture “Proper to Sculpture”, both of which laid out the intellectual territory for subsequent new generations of students. All these things contributed to an ethos at St. Martin's of open, often fractious, but, as far as possible, honest and objective debate about art in general and sculpture in particular, exemplified by the evolving democratisation of the relationship between staff and students over the years, and, most tellingly of all, by the weekly 'crits' of work by students, staff and invited guests. These proved to be a hugely important and influential institution at St. Martin's, which acted as a forum open to comment by all and sundry, from the lowliest first-year student to the most eminent of visitors. This open and critical debate, focussed on what could be seen to be happening in the work itself, gave direct rise to similar attitudes at satellite studios such as Stockwell depot in the 1970's and Greenwich Studios in the 1980's. For some, the obsession with an empirical search for a heightened and explicit three-dimensionality has become the touchstone of their involvement with sculpture. These artists have pushed their search for form beyond 'formalism', beyond the limits of literalism in 'object-making', yet without its relinquishment, a line perhaps of most resistance in their art. There is still unknown territory for sculpture to explore here - in particular abstract sculpture - and it remains very much unfinished business for these and other sculptors from St. Martin's.